The Hindu - Muniyaras( dolmen) as seen in Marayoor, a most popular tourist destination in Idukki district in Kerala. 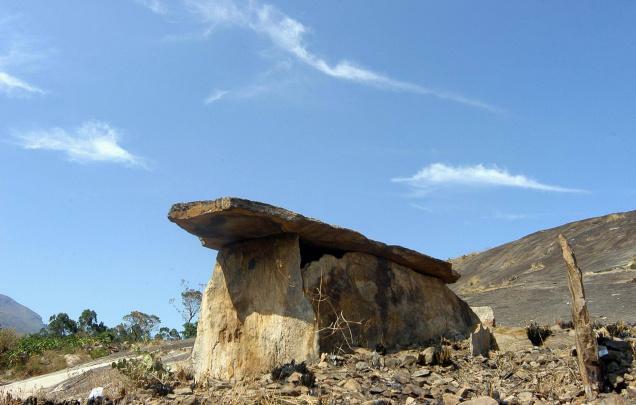 These dolmenoid cists are burial chambers that belong to the Megalithic age and are made up of four stones placed on edge and covered by a fifth stone called cap stone The Muniyaras of Marayoor are located on a tall broad cliff. Apart from the dolmens of Stone Age, several dolmens of Iron Age exist in this region especially on the left side of river Pambar as is evident from the usage of neatly dressed granite slabs for the dolmens. A file photo K.K. Mustafah. Discovering Idukki, a project to explore and document the rich heritage of the district has been started and in the first phase of the project a heritage museum will be opened at the district headquarters in Painavu by April this year. The project is being implemented by the district panchayat and the archaeological explorations will be conducted in various sites of dolmen in Marayur and the megalithic sites where the `nannagadies' (burial urns) were excavated especially in the high Ranges. T. Rajesh, officer-in-charge of the project said that the study may open unknown chapters of Kerala spice trade during the Stone Age and later. Kerala Council for Historical Research (KCHR) will provide the technical support for the project, he said adding that the Muzaris heritage has a strong link to the High Ranges because cardamom is indigenous to the hill tracts. In 1341, he said that the water bodies in the Periyar river basin underwent a major transformation. “The prosperous city of Muziris at the mouth of the Periyar overlooking the Arabian Sea suddenly dropped of the map due to a flood or earthquake or both,'' he said. Muzaris was silted over and its site was left to conjecture. The excavations by the KCHR in 2007 and 2008 unearthed valuable information which threw light on its location and more. The archaeological and historical data gathered on Muziris provided further evidence to show that it was a veritable business and cultural centre with wide international associations. He said that it was through the Muzaris trade channel, the people of South India were afforded connections with various civilisations of West Asia, Near East and Europe. The excavation project there provided a wealth of information not only on the port but also on its hinterland, the whole Periyar basin and the historical towns of Kodungalloor, Pattanam and Paravur. Many important finds like human bones, storage jars, gold ornament and utilitarian objects made of stone, copper and iron were discovered. The structures indicate a vast urban settlement. The excavations suggest that the site was first occupied by the indigenous Megalithic people followed by the Roman contact in the early Historic Period. He said that the excavations in Idukki will also provide valuable data on the life during the Megalithic period. The team of historians, students and teachers of history will also be formed for research works. The items collected will be made available at the heritage museum so that those interested in history can learn the life of the Megalithic era in details. Mr Rajesh said that only individual studies had been so far done in the Megalith site in the district and the project envisages protection of the historical site with technical support as in the case of dolmens, many faced various kinds of damage including those due to human interference.